Here's how the software company, founded on April 4, 1975 by Bill Gates and Paul Allen, paved the way for personal computing and dominated the market. Microsoft is the company that made personal computers mainstream, with one in almost every home and office. And it all started when co-founders Bill Gates and Paul Allen were in middle school in the mid-1960s, teaching themselves how to code. Although the plain-English BASIC programming language was designed to make it easy for anyone to use a computer, access to computers was limited back then. Companies such as General Electric would lend time on their machines to curious students who wanted to experiment with the technology. From these early days, Gates and Allen established their vision for the new technology and were extremely persistent in experimenting with it. These traits ultimately led them to build one of the most influential technology companies of all time. After 43 years, Microsoft is among the five highest-valued companies listed on the Nasdaq, along with Facebook, Apple, Google and Amazon. It's market cap as of early April 2018 was almost $680 billion. Read on for 10 highlights from throughout Microsoft’s history -- founded on April 4, 1975 -- and how the company and its leaders have adapted their goals over time. A company called the Computer Center Corporation realized that sharing their machines with Gates and his fellow teen computer enthusiasts could be a boon, rather than a burden. They made a deal: Unlimited computer time for the students in exchange for their help finding bugs in the system. This was the first of many arrangements Gates and Allen had with various organizations to gain computer access. They even made some money in exchange for their skills, including a gig with the Washington state highway department. They called their operation Traf-O-Data, using a computer they’d built to analyze traffic data. Gates finished high school and headed to Harvard to study pre-law, but the classroom didn’t afford him an opportunity to develop his programming skills. Allen, who’d attended Washington State University, worked for Honeywell in Boston nearby. The duo knew they had more potential to apply their knowledge, and it was the announcement of the Altair 8800 minicomputer hobbyist kit in late 1974, on the cover of Popular Electronics, that led to their big break. If computers were going to go mainstream, they’d need software. Gates and Allen built an interpreter for the BASIC language that could run on the Altair, which they sold to the computer’s manufacturer, Micro Instrumentation and Telemetry Systems (MITS). Within a matter of months, 22-year-old Allen and 19-year-old Gates had relocated to Albuquerque, N.M., where MITS was based. Gates had dropped out of Harvard, and the two had formed a company called Micro-Soft (originally hyphenated). A few years later, Microsoft relocated to Bellevue, Wash. Shortly after this move, Microsoft scored a deal with IBM that propelled it ahead of its software developing competitors. In the summer of 1980, IBM was developing a personal computer but needed an operating system to run on it. After failing to reach an agreement with Digital Research, the makers of an operating system called CP/M, IBM enlisted Microsoft’s help. Microsoft didn’t have an operating system of its own, but it knew about one that was similar to CP/M, called QDOS, created by a company called Seattle Computer Products. Microsoft licensed QDOS and developed a version of it for the IBM PC. In the summer of 1981, Microsoft incorporated, then purchased the full rights to QDOS from Seattle Computer Products. On Aug. 12, IBM introduced its personal computer running MS-DOS 1.0 -- the operating system Microsoft built from QDOS. In a contract with IBM, Microsoft specified that IBM would not have exclusive rights to MS-DOS. 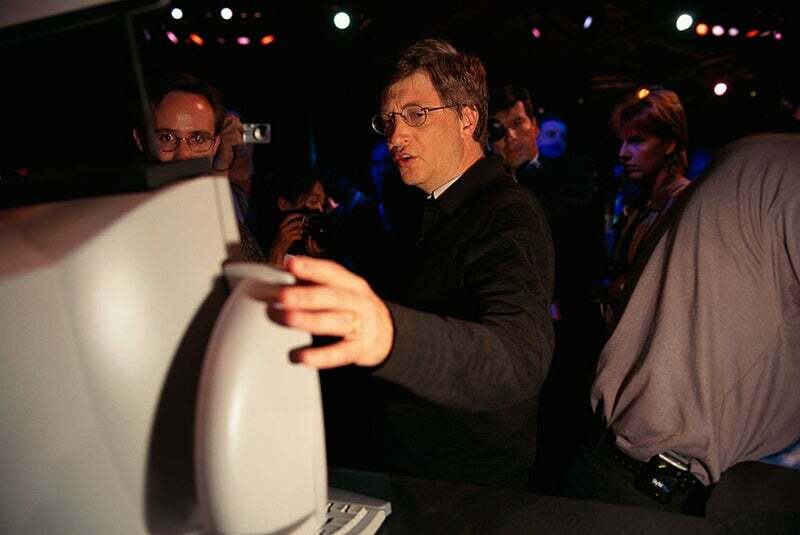 This was a savvy move that helped Microsoft become the number-one computing platform. It didn’t take long for competitors to copy IBM’s hardware, and when they did, Microsoft was happy to supply the software. Apple, which at the time was also developing an operating system, wasn’t so keen on taking this approach with its software. A key deal that paved the way for Microsoft’s success was a deal signed by Gates and Apple CEO John Sculley in 1985. Right around the time that Microsoft first released Windows, Apple granted Microsoft a “non-exclusive, worldwide, royalty-free, perpetual, nontransferable license to use [parts of the Mac technology] in present and future software programs, and to license them to and through third parties for use in their software programs,” according to Cult of Mac. This deal had major consequences for both companies as Microsoft continued to develop its operating system and some new software programs. Now that computers were up and running with Microsoft’s operating system, the next step was to build tools to streamline the user experience. Today, it’s hard to imagine a world where computers didn’t run programs such as Microsoft Word, PowerPoint and Excel. These “productivity applications,” as Microsoft calls them, were revolutionary tools for getting work done. They automated many of the aspects of word processing, accounting, creating presentations and more. Plus, Microsoft’s deal with Apple allowed it to develop versions of these programs for Macintosh computers. Over the years, Microsoft has provided updates to the Office Suite, from additional programs (such as Outlook and Access) to additional features. Operating systems weren’t always as visually appealing or user-friendly as they are today. Originally, users would have to know a programming language to use them, typing in text commands to perform functions. But graphical user interfaces (GUI), a concept which originated at Silicon Valley R&D unit Xerox Parc, incorporated icons and menus for users to click on, as well as various windows for different programs. That’s where Windows came in. Microsoft released the first version of Windows in 1985, competing with Apple, which was also developing a GUI at the time. In 1988, Apple sued Microsoft for copyright infringement, but eventually lost, thanks in part to that agreement Sculley and Gates signed. 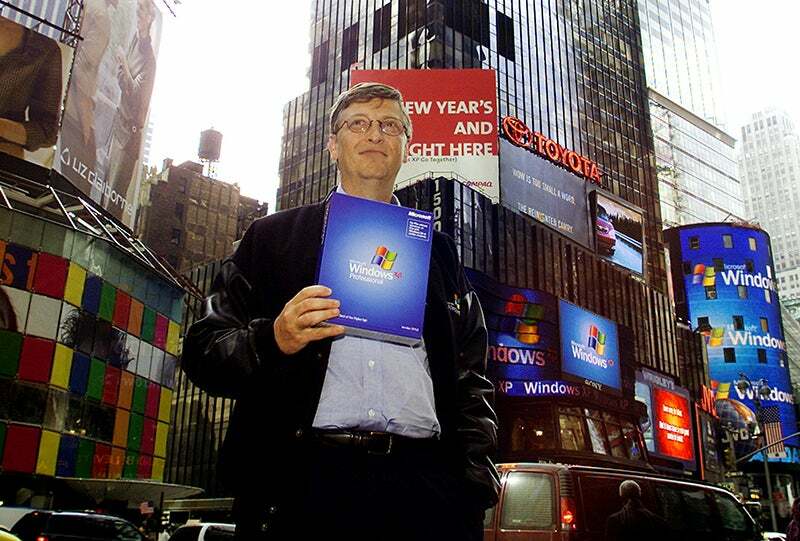 Microsoft went on to release subsequent versions of Windows, most notably Windows 3.0 in 1990, Windows 95, 98 and 2000 in those respective years and Windows XP in 2001. All of Microsoft’s efforts to dominate desktop computing led to an antitrust suit brought by the U.S. government. Microsoft appealed the judge’s ruling that it would have to break into two divisions. It instead agreed to take steps to help competitors integrate their software with Windows by sharing APIs with developers. 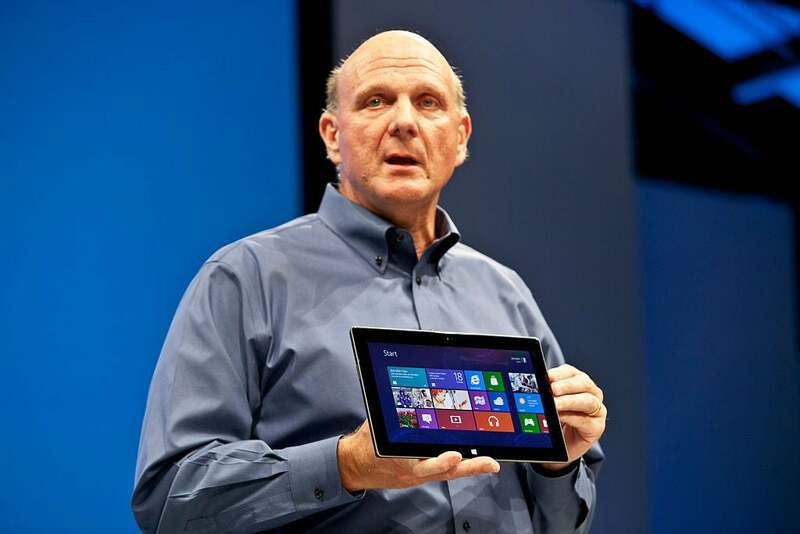 Gates stepped down in 2000 and Steve Ballmer, who had been with the company since 1980, assumed the role of CEO. Gates, meanwhile, remained chief software architect until 2006 and chairman until 2008, when he left to devote his time to philanthropy through the Bill and Melinda Gates Foundation. Throughout the ‘00s, Microsoft, under Ballmer, failed to keep up with the rise of smartphones, tablets and internet search, despite attempts such as the Windows Phone and Bing. Today, Android’s operating system dominates the mobile market. In October 2012, Ballmer announced Microsoft would shift away from software and become a “devices and services company,” doubling down on phones, tablets (the Surface) and other hardware such as Xbox (one of the biggest successes of the Ballmer era), along with cloud computing. Ballmer remained CEO until 2014, when Satya Nadella took over and led the company away from “devices and services” less than two years after Ballmer declared that focus. The $7.2 billion acquisition proved to be a colossal failure. By May 2016, Microsoft had laid off most of the 25,000 Nokia employees that had joined the company, according to The Verge. Microsoft had been in partnership with Nokia since 2011, and some saw the acquisition as a necessity to stop Nokia from switching from Windows to Android on its mobile devices. However, it ended up backfiring, and it wasn’t enough to help Microsoft get an edge in the mobile market. One Nadella-era acquisition that’s been beneficial to Microsoft is LinkedIn. Microsoft announced it would buy the professional networking platform for $26.2 billion in June 2016. It was a major step toward Nadella’s new vision for Microsoft as a company that provides business services tech. In April 2017, Backchannel’s Jessi Hempel reported that LinkedIn founder Reid Hoffman had joined Microsoft’s board and would be an ambassador to Silicon Valley during a time when the company needed to restore its innovative, collaborative reputation. Under Nadella, the company has shifted away from consumer tech and toward business services, particularly subscription- or advertising-based online services such as cloud computing. In March 2018, Nadella announced a reorganization of Microsoft into two main divisions: “Experiences & Devices” and “Cloud + AI.” Nadella continues to prioritize Microsoft’s Azure enterprise cloud platform over Windows. Related video: Bill Gates Storms the White House! Here Are 3 Things to Know Today.